New Aircraft Aluminum Gas Block with 4 Picatinny rails. Now you can mount detachable front sights, lasers, flashlights, etc all at the same time. Currently made for the DPMS Bull Barrels. Comes ready to install. 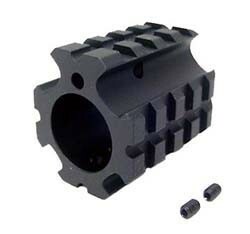 Bore diameter is .936 or .750 Anodized Black.